A large and growing number of congregations are setting up church-based nonprofit organizations in order to operate community development or educational programs. Once formed, the nonprofit structure allows for new opportunities for accessing additional funding and drawing new collaborative partners and volunteers into the ministry. Joy Skjegstad outlines the step-by-step procedures for setting up a 501(c)3 nonprofit organization connected to a congregation using simple, easy-to-understand terminology and plenty of examples from churches that have already taken on this task. In addition to accessible and specific information on the legal aspects of a church-based nonprofit, topics include: . Why set up a nonprofit? . Advantages and disadvantages to setting up a nonprofit . Assessing readiness for the challenge . Defining the nonprofit's mission and niche . Accountability and control . Establishing a board structure and defining board roles . Maintaining a positive relationship with the congregation . Personnel issues . Developing a fundraising plan . 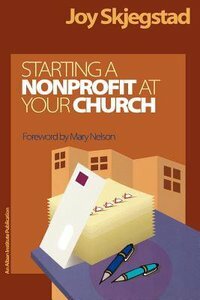 Ongoing evaluation Whether a congregation is setting up new program or has an established nonprofit that needs to be restructured or redefined, congregations will find helpful guidance in this practical, experience-based book. About "Starting a Nonprofit At Your Church"
Joy Skjegstad is the founder and director of the Faith Communities Project, a training and resource program designed to build the management capacity services to about 50 churches that have started separate nonprofits and for five years was executive director of a congregation's community outreach nonprofit.